I’m am so addicted to smoothies! Every day, sometimes twice a day. I just can’t get enough! They are so easy, so healthy, and so quick to whip up. But this smoothie, the Golden Milk Turmeric Smoothie, this one is really special. Turmeric is a spice native to India that boasts tremendous health benefits. Turmeric is reported to reduce inflammation, ease depression, and even help prevent cancer! All that goodness in one delicious smoothie? Yes please! Curcumin, the beneficial compound found in tumeric, is a powerful antioxidant. The bioavailability of curcumin increases dramatically when it’s combined with healthy fats and black pepper, so this Golden Milk Turmeric Smoothie recipe uses coconut milk (bonus- it’s delicious!) and a dash of black pepper so your body can absorb all yummy goodness and get all of the health benefits. The turmeric has a strong flavor, so I would start with 1 teaspoon for 2 smoothies to start. This Golden Milk Turmeric Smoothie is delicious on it’s own, but if you have time to whip up some coconut cream, I highly recommend it! It takes less than five minutes and keeps in the fridge for about a week. Make a batch and save the rest to eat with berries or on top of our super tasty No-Bake Chocolate Peanut Butter Pie! 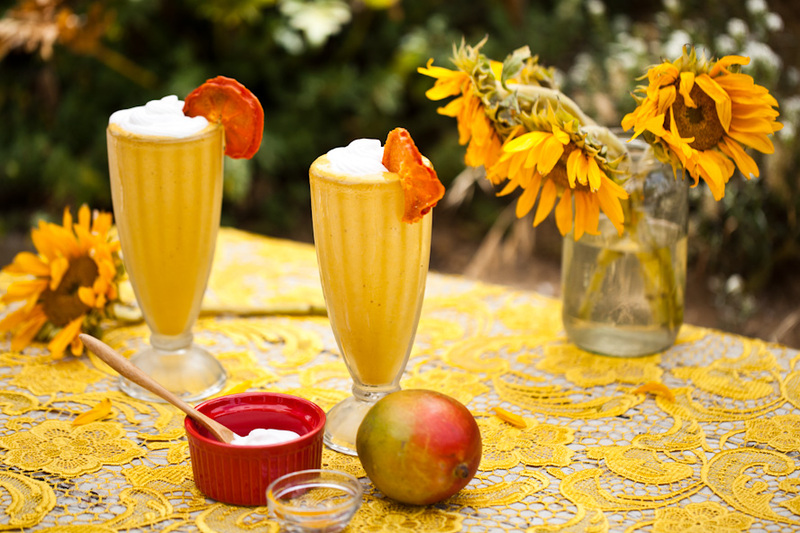 Divide the Golden Milk Turmeric Smoothie into two glasses and top with Whipped Coconut Cream if desired. I love making Golden Milk Turmeric Smoothies for breakfast. They are sweet, filling, delicately spiced, and GORGEOUS! I love the color so much, I bought a yard of golden yellow lace to go with it. All yellow everything! If you like this Golden Milk Turmeric Smoothie recipe, be sure to check out our Matcha Avocado Smoothie or our Blueberry Cobbler Smoothie! Hello, im new to your site and I have a question about smoothies and weight loss. Dont they make you gain weight, especially fruity ones? Thanks for stopping by! So sorry for the delayed response. I didn’t get an email about your comment for some reason. I’m not a nutritionist, but I have never experienced any weight gain eating fruit smoothies- the opposite actually. As part of a balanced diet, and without any added sugar, I feel they are an excellent way to consume fruit, especially on the go! This was so delicious!! Thanks for the recipe! So yummy! I added a little cinnamon too, so great! Where is the recipe for the whipped cream? Hi Megan. Just made this and my goodness it’s great. Not a fan of spices so only used one tsp to Turmeric, but so yum. Was going to make the cream, but made the mistake of taking a sip first and so the cream got forgotten. Making again – Love the site and the recipes. In order to gain the benefits of turmeric, it does need to be “cooked” and have an added fat (such as coconut oil) and freshly ground black pepper. This little concotion is called “Golden Paste” and you can make it and freeze small portions, and can be added for a smoothie. If you want to know know just Google “Golden Paste” and you will find both the recipe and the technique to make this magic stuff. Thanks for this wonderful site. So glad a friend suggested it!